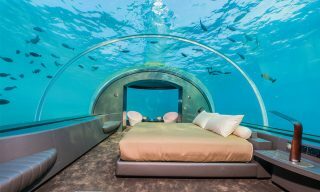 Imagine waking up not to shafts of sunlight peeking through the curtains, but to 180-degree panoramic views of Indian Ocean’s colorful marine life. 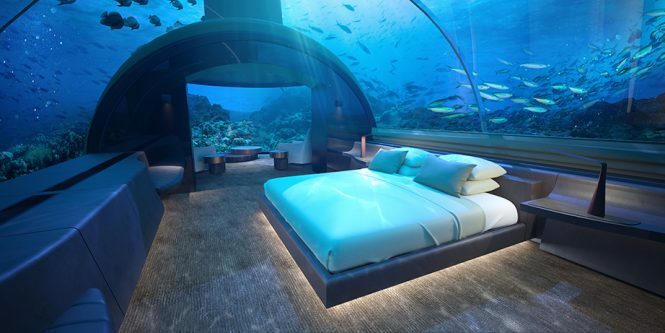 This could soon be the reality at the world’s first undersea residence, currently being constructed at Conrad Maldives Rangali Island. Slated to be completed by end 2018, the US$15 million project is named The Muraka, or “coral” in Dhivehi (the local language of the Maldives), and will complement the property’s undersea restaurant, Ithaa — another world first. 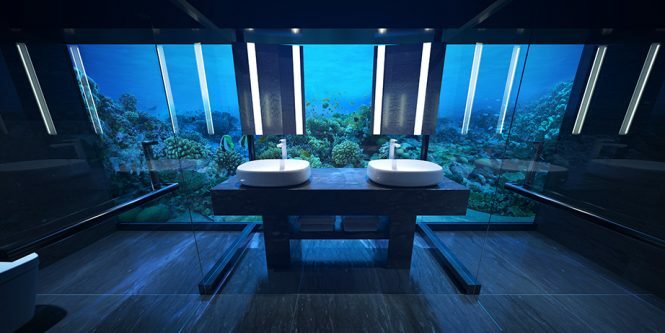 Designed by the same team behind Ithaa, the two-story undersea residence will accommodate up to nine guests at any one time, allowing them soak in the breathtaking marine environments of the Indian Ocean. Situated above sea level, The Muraka’s upper deck comes with a twin-size bedroom, bathroom, powder room, gym, butler’s quarters, private security quarters, integrated living room, kitchen, bar, and dining. Created with great views in mind, the villa comes with two decks; one facing the east and the other looking towards the west, so that guests can catch both sunset and sunrise with ease. 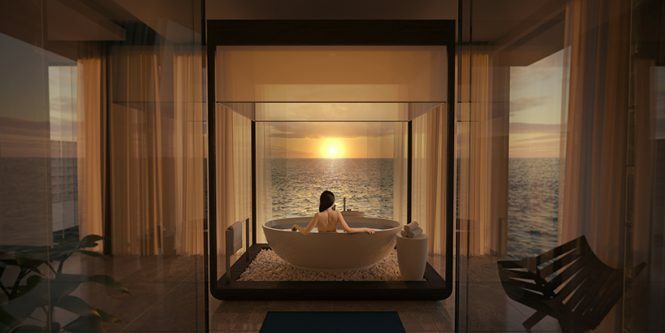 Guests can also opt to stay in the upper level’s master suite, which has an ocean-facing bathtub that’s perfect for soaking up views of the horizon. 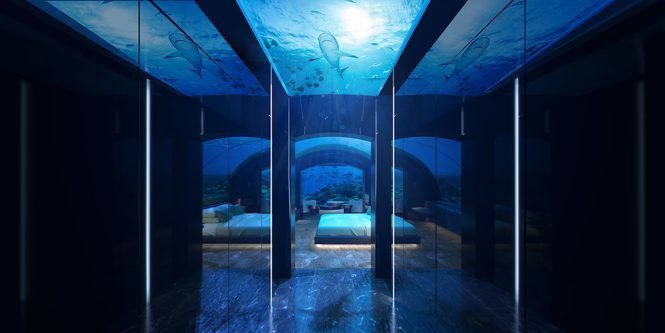 Under the ocean’s surface at about five meters below sea level, the residence’s lower deck features a stunning undersea suite, which comprises a king-size bedroom, living area, bathroom, and spiral staircase that leads to the upper level living room. Guests can spend all day marveling at uninterrupted views of the surrounding marine environment, thanks to the residence’s curved acrylic dome, which boasts 180-degree views of marine life. 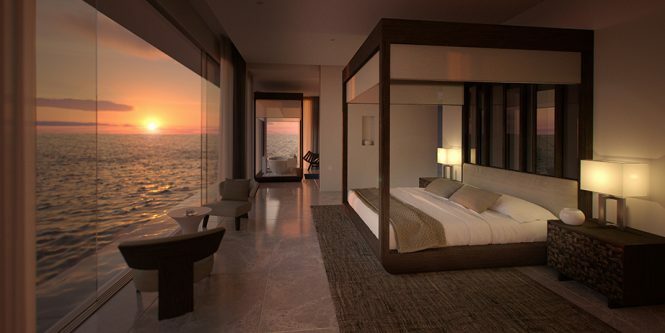 For those who can’t wait until The Muraka’s completion, there’s always the option of staying in Conrad Maldives Rangali Island’s over-water villas and suites, while enjoying the tropical nation’s unparalleled diving and snorkeling spots.